WASHINGTON, DC, December 10, 2012 (ENS) – President Barack Obama has asked Congress to appropriate $60 billion to help in the rebuilding of the states and cities from North Carolina to Maine devastated by superstorm Sandy in late October. 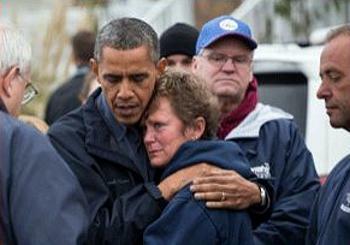 To manage the recovery effort, Obama established the Hurricane Sandy Rebuilding Task Force by Executive Order on Friday, “to provide the coordination that is necessary to support these rebuilding objectives.” The task force will be chaired by Housing and Urban Development Secretary Shaun Donovan. 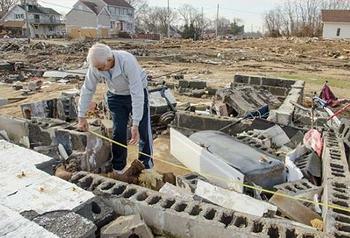 On October 29, Hurricane Sandy made landfall in New Jersey. Stretching more than 1,000 miles in diameter, the superstorm’s high winds and storm surge caused widespread flooding, loss of life, displacement of persons, and damage to private property, public infrastructure, and federal government facilities. A dangerous nor’easter followed nine days later causing more damage and undermining the recovery effort. The President’s request to Congress is the result of weeks of discussions with lawmakers and officials from New York, New Jersey and other hard-hit states who requested billions more. Still, they praised the President’s supplemental appropriations request and urged Congress to adopt it immediately. “It’s not everything we wanted, but it’s close enough,” said Senator Charles Schumer, a New York Democrat, told reporters. Although the House Republicans and President Obama are at odds over tax rates and tax cuts on January 1, 2013, nicknamed the “fiscal cliff” Mayor Bloomberg is hopeful that Congress will quickly approve the money for storm recovery. New York Governor Andrew Cuomo, a Democrat, and New Jersey Governor Chris Christie, a Republican, who are responsible for the two states that suffered the greatest damage, issued a joint statement Friday supporting the President’s $60 billion request. “The request is crafted to afford maximum flexibility to state governments and we will continue to work with the Administration and Congress as our needs arise. We thank President Obama for his steadfast commitment of support and look forward to continuing our partnership in the recovery effort,” said the governors. Governor Cuomo today announced that starting today the MTA Long Island Rail Road will operate full morning and evening rush hour service for the first time since superstorm Sandy struck six weeks ago. The restoration is the result of Amtrak restoring the signal system capacity in one of its two flood-damaged East River tunnels. Mayor Bloomberg said the New York Sanitation Department already has removed roughly 350,000 tons of storm debris from the coastal communities of the Rockaways, Breezy Point, Coney Island and the southern shore of Staten Island. “If you look carefully, you’ll notice there’s no electricity yet, and people had enormous damage from floods inside, but outside the Sanitation Department has done a wonderful job,” the mayor said. “There were 200 homes that were destroyed or are beyond repair, in addition to more than 500 other homes that really have major structural damage and need real repairs. The rebuilding process will be an enormous undertaking, and not just for homeowners, but for entire communities,” said Bloomberg. As of mid-November, approximately 16,300 Con Edison electricity customers in flood-ravaged areas of Brooklyn, Queens and Staten Island still could not get electrical service until their own internal equipment is repaired, tested and certified by an electrician as ready for service. Mayor Bloomberg has waived city fees related to the testing and certification. 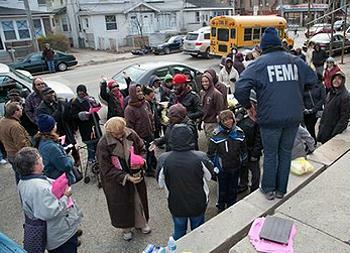 Across all states hit by Sandy, the Federal Emergency Management Authority has deployed 7,099 personnel. A total of 502,016 assistance registrations have been received by the federal government, which has approved $1.07 billion in assistance. As for the President’s $60 billion proposal, Senate Majority Leader, Democrat Harry Reid, said he does not believe the recovery appropriation needs to be financed with savings elsewhere in the government’s budget. A spokesman for House Majority Leader, Republican John Boehner, said he is “reviewing” it.